DAVIE, Fla., Dec. 6, 2018 /PRNewswire/ -- Bankers Healthcare Group, a leading provider of financial solutions for healthcare professionals, has been named a best place to work for diversity by Great Place to Work and FORTUNE magazine. BHG took the #61 spot on the list this year, jumping nearly 40 spots from last year's list. It is the company's second time being featured. "We're very proud of our diverse workforce and inclusive culture," said BHG Director of People Relations Eddie Roman. "Each of our employees brings unique viewpoints to the table and encourages new ways of thinking." 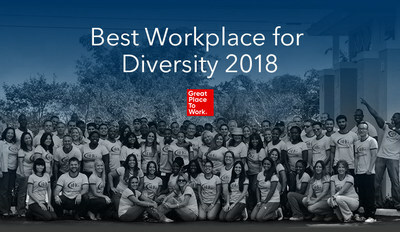 See the full ranking here: http://fortune.com/best-workplaces-for-diversity/. Most recently, in October 2018, the company was ranked #6 on the South Florida Business Journal's list of South Florida's top Hispanic-Owned Businesses. Bankers Healthcare Group provides innovative, hassle-free financial solutions to healthcare professionals. Since 2001, BHG has provided more than $3.8 billion in financial solutions to satisfied customers nationwide and worked with over 110,000 practitioners. BHG is proud to maintain partnerships with leading healthcare industry associations, and is recognized regionally and nationally for innovation, continued growth, and being a best place to work. BHG is partially owned by Pinnacle Financial Partners. To learn more, visit www.bankershealthcaregroup.com, and follow us on Twitter, LinkedIn and Facebook.